KABUL - US Special Representative for Afghanistan Reconciliation Zalmay Khalilzad wrapped up his two-day visit to Islamabad where he held meetings with Pakistani officials to discuss issues around the Afghan peace process and Pakistan’s role in this regard. 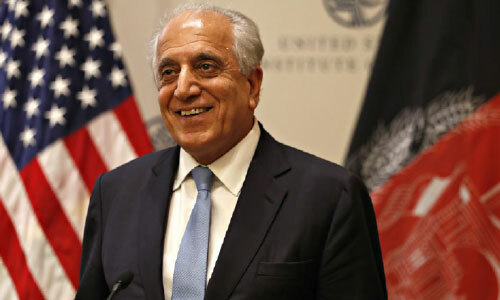 Reports indicate that Khalilzad will meet with Afghan leaders on Sunday, which will be a follow-up of his first meeting with the government leaders and Afghan politicians where they discussed the Afghan peace process and the upcoming Qatar meeting. On Friday, April 5, Khalilzad held talks with Pakistan’s Chief of Army Staff Gen. Qamar Javed Bajwa and discussed issues around regional security and the ongoing peace efforts in Afghanistan, Pakistani media reported. “During the meeting overall regional security situation with particular reference to ongoing Afghan reconciliation process were discussed. The visiting dignitary appreciated Pakistan’s efforts towards peace process, the Inter-Services Public Relations (ISPR) said in a press release on Friday, April 6. Khalilzad who visited Islamabad as part of his multi-nation trip on Afghan peace also met with Pakistan’s Foreign Minister Shah Mehmood Qureshi. Pakistan’s Foreign Ministry said in a statement that Ambassador Khalilzad briefed the Foreign Minister on the outcome of Doha talks and his recent engagements in the region, Pakistan’s Foreign Ministry and that he also shared updates on his meetings in Afghanistan and the dynamics of the intra-Afghan dialogue. Qureshi, while appreciating his efforts, reiterated Pakistan’s commitment to the peace process. He said that intra-Afghan dialogue is a vital component of the reconciliation process. Qureshi said that Pakistan wishes well for the peace and stability in Afghanistan which would directly benefit Pakistan’s own vision for economic and human development. Khalilzad also had delegation level talks with Foreign Secretary Tehmina Janjua. He was accompanied by an interagency delegation. Janjua was assisted by senior officials from the Ministries of Foreign Affairs and Defense. According to the statement, Janjua briefed Khalilzad about a telephonic conversation between Qureshi and US Secretary of State Mike Pompeo. She informed about their mutual interest in further progress on Afghanistan peace efforts and that they agreed to remain engaged to pursue the reconciliation process. This comes as Khalilzad, during his five-day stay in Kabul, met with Afghan leaders, politicians, civil society members, youths, women and tribal elders where they exchanged views on Afghanistan’s peace process. A day before his trip to Pakistan, Khalilzad said Pakistan should change its policy towards Afghanistan; otherwise, “Islamabad and Washington’s ties will not improve”.